Description Video Game Podcast incoming! Welcome to the End of Time Cast! Michael, Chris, and Adam discuss the gaming industry, reminisce about their beloved hobby, and debate about chosen topics in the gaming world. Description: Game of Thrones to Mass Effect? Michael and Chris connect the two in this episode! Description: Lots of titles to go over when discussing 1997 in video game history! Description: Making video Games? A dream job? After the boys discuss this topic, you be the judge. Description: Chris and Michael idea-craft a new Zelda, reminisce about Persona 5 again, and discuss the first ever Sony's State of Play. 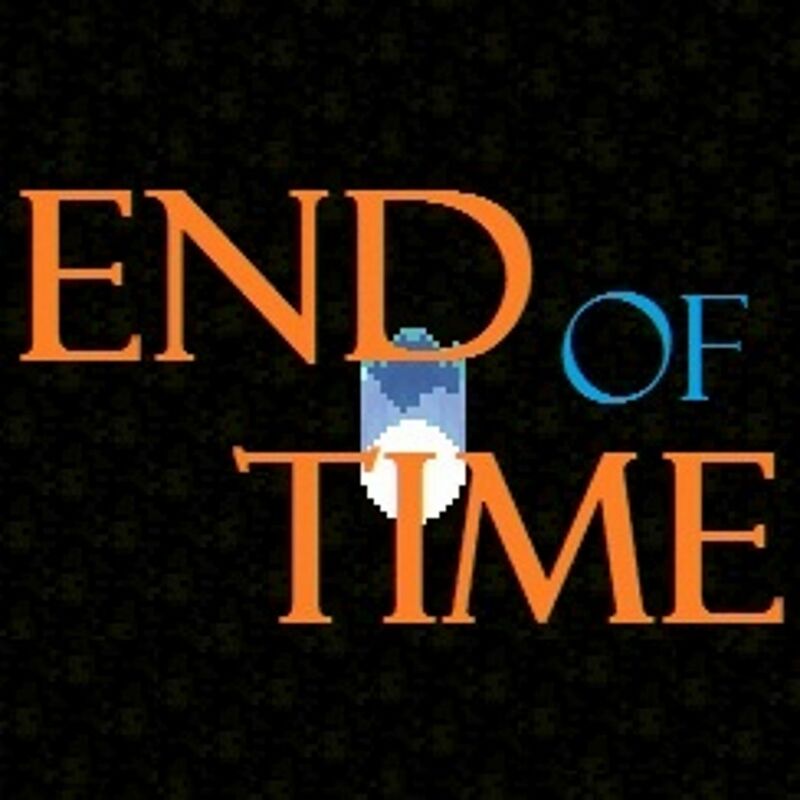 Description: The End of Time Cast travels back to 1996 to debate another Game of the Year! Description: Michael and Chris do a slight retrospective on the Devil May Cry franchise! Description: Discussing the finer points of Kaizo Mario games, Anthem, and Kingdom Hearts (3). Description: As Michael journeys to the center of the earth, Adam and Chris host the show without him, again! Description: Picking our top 5 favorite games from an underrated classic console: the Sgea Dreamcast. Description: Discussing games with various levels of interactivity. And, calling it now - how Konami will troll the world! Description: Continuing to discuss the legacy that is (was?) Squaresoft and Final Fantasy. Description: The boys take a close, analytical look at the potential results of humanity actually having Holodeck technology. Description: Chris and Michael review 1996 in gaming history! Description: The boys go over the 2018 Game Awards show! Description: After one canceled week, and being down a member for another, the End of Time Cast is back to normalcy.... or as normal as they care to be in this catch-up banter episode! Description: What happens to the End of Time Cast whenever Adam and Chris are left to their devices with no Michael around? Listen in to find out! Description: Michael, Chris, and Adam record in-studio together for the first time, along with special guest Brian "Rock", in this special episode of the End of Time Cast - re-addressing Episode 1 "Top 5 RPGs Of All Time"! Description: The boys take a look back at 1995 and decide on an End of Time Cast Game of the Year. Description: Michael, Chris, and Adam banter on again, about Ataris, the internet, and Squaresoft! Description: Adam joins the boys for another Banter episode! Description: Michael and Chris talk about a few card-based games! Description: Chris and Michael review another banner year in gaming history: 1995. Description: Chris and Michael weigh the validity of concepts such as lives, game over, and continue in the late 2010s of gaming. Description: Michael and Chris ALMOST spend an episode reviewing Assassin's Creed: Odyssey, but instead just talk about random news items and have some banter conversation. Description: The End of Time Cast weighs in on their pick for the 1994 video game of the year! Description: Michael and Chris have played, and completed, the 2018 Playstation 4 Spider-Man game, and review/discuss it on Episode 57 of the End of TimeCast! Description: Adam and Michael discuss artist notoriety, the pre-TGS show, the latest Nintendo Direct, and aliens. Description: Chris and Michael look at the year 1994 in video gaming history! Description: Chris and Michael give several shout-outs to their favorite Twitch and YouTube content creators! Description: Michael and Chris do a quick recap of the 2018 AUG 21 - 23 Gamescom announcements! Description: Chris and Michael weigh the pros and cons of Early Access. Description: Michael and Chris debate the End of Time Cast hierarchy of their top picks in 1993's video gaming history. Description: Remembering some rage-enducing moments when we were stuck in video games. Description: Michael and Chris banter on about topics, news, and stuff! Description: Michael and Chris get all scientific and factual as they express their opinions on Zombies. Description: Join the boys in a discussion and review of 1993 in video gaming history. Description: On this episode of the End of Time Cast, Michael, Chris, and Adam discuss nerd culture. Description: Settle in for the long haul, the boys are counting down their own personal top 15 Playstation games in this lengthy episode of the End of Time Cast! Description: What's our pick for the best video game of 1992? Find out on this episode as the boys have another debate! Description: The boys pour over all the 2018 E3 conference details, talking about the highs and the lows! Description: Hype? Predictions? Rumors? Buckle in for Episode 045 guys and gals, as the the End of Time Cast talks E3 2018! Description: Episode 044 is a good ol' general discussion marking Adam's return to the End of Time Cast! Description: Michael and Chris get WOW'ed by video game sequels that were better than their predecessors! Description: Spoilers Inside - Chris and Michael have a thorough discussion on Avengers: Infinity War. Description: Another year in review, 1992! Description: Michael and Chris dig for diamonds in the rough, looking for good moments in bad games. Description: End of Time Cast pit 1991 games against each other - the victor is declared their Game of the Year! Description: Chris and Michael count down (....up?) their top 10 NES games! Description: Michael and Chris look back at the 80s and give an End of Time Cast seal on their video game year of the entire decade! Description: Taking note of titles in 1991, on Episode 036 of the End of Time podcast. Description: "This is my sports", says Michael, as he and Chris talk about the awesome video game speed running community! Description: Michael and Chris tackle the question on the table: Is Nintendo dying? Description: Kicking off a new End of Time Cast series: our very own Game of the Year! With the first episode of the continual series, Michael and Chris discuss/debate what they decide was the Game of the Year for 1990! Description: Taking a look at the entire Halo series! Description: Chris and Michael meticulously choose 5 different video games to showcase video gaming to people who aren't necessarily acquainted with gaming. Description: Starting the 90's off with a review of 1990! Description: On Episode 029, Michael and Chris talk about MMORPGs! Description: Michael and Chris count down their top 10 N64 games! Description: Spend that money! Michael and Chris discuss in-game purchases. Description: Passwords? Peripherals? Programs? Today the End of Time Cast comes clean about cheating. Description: Chris and Michael use the Gate Key again and travel back to 1989, for reviews and memories! Description: Michael and Chris review the entire rich history of the Final Fantasy series. Description: Chris and Michael count down their Top 10 Sega Genesis games! Description: Wrapping up the 2017 Game Awards! Description: Going over the games of 2017... which turns out to be basically a review of the 2017 Game Awards!! Description: Rummaging through the old gaming boxes, talking about video game peripherals. Description: Video game movies? Video game movies. Description: 1998, and the noteworthy games therein! Description: Reliving some of those old subscriptions - the kind before YouTube! Description: Mobile gaming: our thoughts on the state of mobile gaming, our personal experiences, and where we see mobile gaming going. Description: Back by popular demand, the End of Time Cast gets a new host, Chris (tehKrizz). This episode is a re-do of the very first episode, the long-lost Zero episode. Michael and Chris reminisce about their histories in the video game world. Description: Talking about fond/memorable/favorite stories in the gaming world! Description: There are many villains in gaming that you can sympathize with. We talk about some of the notable ones! Description: Another video games year in review: 1987! Description: Breaking down two Top 100 RPG lists. Description: The PC vs. Console Debate, with a guest! Description: Our first tangent cast: talking table top RPGs and anime! Description: Ever played any crappy games? We sure have. Description: Tackling the topic of video game violence. Description: Adam and Michael start a new series, "The Year In Review" for games, starting with 1985 (and we added 1986)! Description: Discussing our Top 10 SNES games of all time! Description: Guest Cast, discussing game maturity: mature content, and how gaming has matured over time. Description: Talking about the Mass Effect series! Description: Talking about the renowned Legend of Zelda series! Description: Today Michael and Adam talk about some emotional moments in video games. Some tear-jerker moments and a few awesome moments. Description: Today's episode: picking the top 5 RPGs of all time. But, we pick one per the following categories: Music, System, Revolutionary, Story, and Best of All Time. Also, we picked no duplicates - so only one title per category, and no duplicates in either title nor series/franchise.